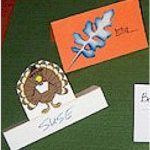 Have the kids make these fun and easy Thanksgiving Indian Corn table decorations and give one to each of your guests as a special treat to take home with them when the feast is over. Cut a piece of paper bag approximately 6" x 6" and twist it into a tight rope. Then unroll the bag, flatten it and cut it into three leaves approximately 1 1/2" by 5" long using the picture as a reference. Cut one finger off of the glove and fill it with candy leaving approximately 1" at the top. Tie your leaves and the candy finger together with the ribbon. This is so easy you can make a lot of them for your centerpiece or place settings so there are enough for everyone.